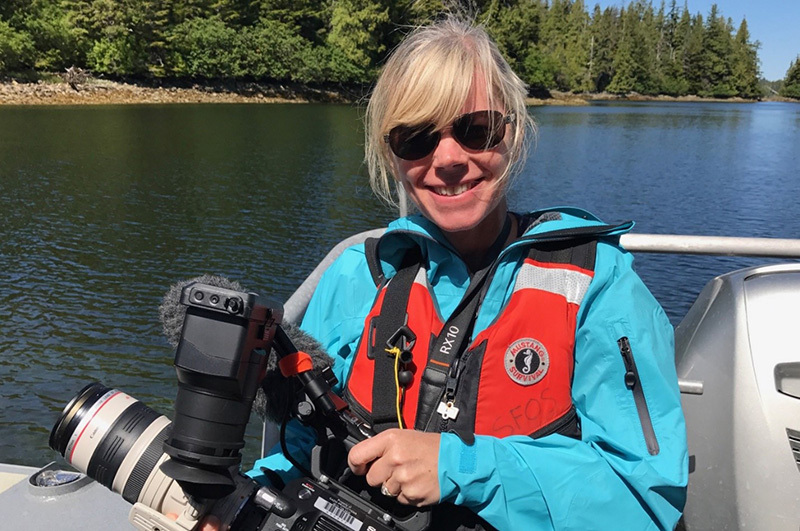 Kristen on assignment off the coast of Prince of Wales, Alaska, where she and her team shot a video about sea otters using VR technology for Earthwatch Institute, a global nonprofit based in Boston. ST. PETERSBURG, FL – Kristen Kusek has been to the bottom of the ocean and to the top of the world’s northernmost active volcano. As part of an IMAX film crew shooting a hydrothermal vent site called 9⁰ North, she descended to the seafloor in the Alvin submersible about 500 miles off the coast of Acapulco, Mexico. Later, on an oceanographic cruise to discover the first hydrothermal vents in the Arctic, she sailed to Jan Mayen before summiting its peak. Her career journey has taken her from Florida to Boston and around the world covering some of the most intriguing stories in earth and marine sciences. “I have the best job in the world,” said Kusek, who returns to the USF College of Marine Science 20 years after she graduated. The first person to graduate from the University of South Florida with a dual Master’s degree in Marine Science and Mass Communication/Journalism Studies, Kristen began her adventures in science communication right here in St. Petersburg. Working with Dr. Peter Betzer, a former Dean of the College of Marine Science, she pioneered the USF Science Journalism Center, a collaboration between the USF College of Marine Science and USF Journalism Studies program, as well as the Poynter Institute and other local entities. This bold beginning led to positions at a number of prominent institutions, including Woods Hole Oceanographic Institution, Earthwatch Institute, and Harvard’s Wyss Institute for Biologically Inspired Engineering. Through all of the positions and promotions, Kristen’s mission has remained the same: to communicate science to people of all walks of life, young people especially. She’s always felt the need to involve the next generation in order to gain any traction in advancing the messages of science. Kids are the future, Kristen says, and we’re handing them a challenging, complicated suite of problems. Hence the necessity to engage them now in dialogues about what it means to be a scientist or about the current problems facing the planet, which will hopefully cause the wheels to start turning in their young minds now and provide better solutions later. Congruent to the theme of outreach consistent in Kristen’s career is her passion for writing. At the core, she is a writer. She loves the process, the audience, and crafting works with a purpose. She often finds herself wishing that she was writing more than the duties of life allow. Talking with her about her passion for writing, I was reminded of those bumper stickers that proclaim what the driver’s other car is, and I think Kristen’s might say, “My other car is a word processor.” Although, frankly speaking, she would rather be doing most anything besides looking at a computer screen. An “old soul,” as she refers to herself, she has never gravitated towards online books and e-readers, and powerfully prefers the feel of a good ‘ol paperback book in her hands. A few other personal notes about Kristen…She has watched the Rocky series more than 100 times (give or take), and she’s gripped every time. Although she’s usually a pacifist, the “I must break you” scene from Rocky IV is oddly her favorite, along with the workout scene preceding the fight. She can’t stand how attached she is to her phone, except for when she’s playing Wordscapes. Her favorite word of all time is senescence. And, lastly, she did not learn that phytoplankton provide oxygen for Earth until GRADUATE SCHOOL (and offers her thanks to her graduate school advisor, now-retired Dr. Gabe Vargo). This failure in her education further underscores her passion for education outreach work. Kristen has, quite serendipitously, come full circle and is now working to promote science for the USF College of Marine Science once again. “In many ways this feels like the most special professional opportunity of all because it’s the place that gave me my wings,” she said. Big plans are in the works, including revitalizing the work of the USF Science Journalism Center, leveraging new storytelling tools such as virtual reality to bring science alive in new ways for new audiences, and establishing a new outreach program in partnership with Boys and Girls Clubs. Kristen knows that what’s been considered the “M” word by many in science – gasp, marketing – is key to success in every industry, including science. She hopes to bring that to the forefront at USFCMS and engage the research community by expanding their vision of scientific storytelling. Kristen standing on the Alvin submersible while docked aboard its transporting research vessel (left) and an approaching view of Jan Mayen, the world’s northernmost active volcano (right).